Styled after the late model Chevrolet full size high performance trucks for your SUPERCHARGED S-10! 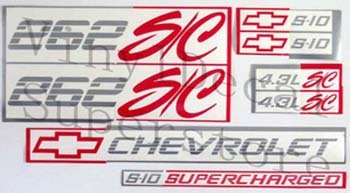 Tailgate decals are 2.8" x 32.8" with RED bowtie with SILVER CHEVROLET letters, and 1" x 23" with SILVER S-10 and RED Supercharged lettering. You also get a pair of each of the bowtie/S-10 (measure 2" x 9.25") and 4.3L S/C (measure 2" x 8.5") decals for your doors. These decals are NOT OEM factory decals. They are custom made. They are made of automotive grade vinyl that will not fade like some printed decals. Thanks to James in France who inspired this kit!